Early yesterday morning, I had a yearn for freshly made bread and was delighted to see Dan Lepard tweet his recipe for Zopako - a Basque Soup Bread - and Castilian Garlic and Bread Soup. Perfect. Despite the fact that my fridge was rammed solid with things purchased for other recipes, this seemed like just the ticket for today. It has to be about the simplest loaf recipe ever. Chuck everything in a bowl, give it a quick knead (10 seconds), leave overnight, shape, rise and bake. Job done. 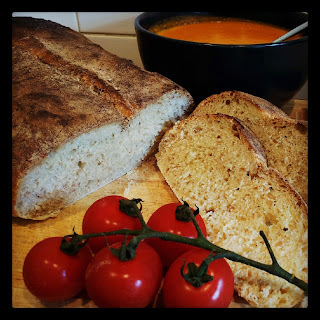 Lovely and crusty rustic loaf with minimal effort. I duly made the dough last night. It only requires a 1/4 tsp of fast action yeast for the rise as you leave it out overnight. This morning it had doubled in size nicely. I shaped it as instructed. Did the rising part. Popped it in the oven. It all seemed to be going too well. Within two minutes, I could smell freshly baking bread. I thought that was a bit odd given that it had literally only been two minutes. But never thought to go and investigate. As a rather seasoned - if not good - baker, I know that you don't check things until they're at least halfway through their baking time otherwise you can expect disaster. The instructions were to bake for 20 mins at 220c and then reduce the temperature for the last 15 minutes. But still that baking smell pervaded the air. At around fifteen minutes, it started to have a 'burnt toast' kind of smell. But I resisted for another four minutes. Which was when I realised that having made toast for Miss A, I'd upped the temperature for the bread bake but had forgotten to switch from grill to oven mode. So I'd literally grilled my loaf. And the burnt smell was the flour dusted on the top singeing. Oops. Slightly panicked, I removed it from the oven, setting off the smoke detectors whilst I did it (and rousing a less than amused husband from his slumber at 9am). Because we live in a modern townhouse, the smoke detectors are linked so if one goes, all three (one on each floor) go in unison. Of course, that set Miss A crying and the dogs howling. I'm now about another fifty places down the husband's scale of things he likes (my last ranking was #483). The loaf was left to cool while Miss A and I escaped for our regular swim, and babyccino with Sainsbury's Cheese Scone (see Sconegate). I assumed that when I returned, I'd end up chucking it away. But actually, it's turned out to be a really nice loaf with a beautiful crumb and the slightly charred crust only lends to the rustic flavour. I think I was saved by the tray of boiling water used to help create a steamy atmosphere in the oven. Will definitely be making again as it's so very easy (if you remember to set your oven correctly) and I want to have a go at making the garlic soup one day - when I won't be in polite company. I the bread it for lunch with the 'soup' I made from last night's leftover sauce and the hubby and Miss A had ploughmans. I'm now planning to have it for tea too, alongside some more of the lovely Three Tomato Salad that I made on Friday. All I need now is some early evening sunshine and a bottle of Chablis and I could pretend I was somewhere a little more exotic than North Wiltshire.